Who’s to say how images come to stick in our mind and how they make their way into our poetry? In the photograph my son is in the summer of his second year. We we were living in Anchorage, Alaska, where the sunflowers grow tall in the nearly full-day sun. 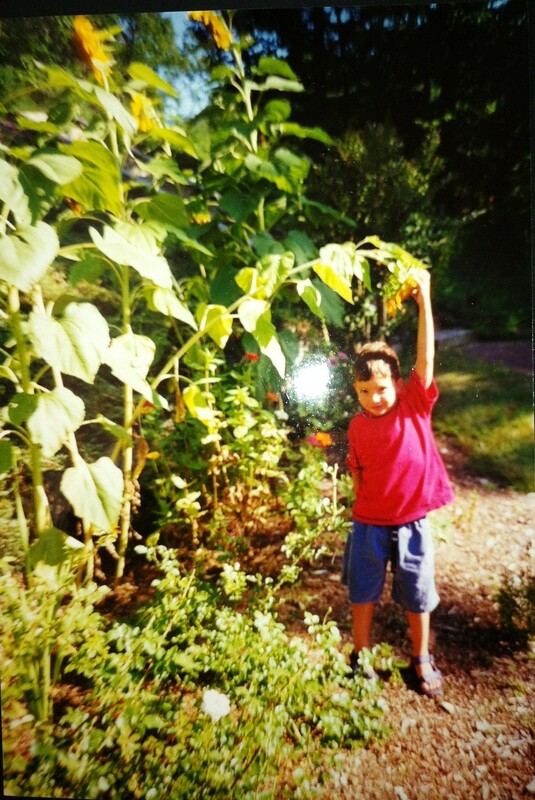 He’s measuring himself up against a sunflower — and bending the sunflower down to touch his head. There are other images of Jasper in his youth that appear in that poem and things that we saw out on hikes together. merely saying it may make it so. –no, the child growing taller. Is home the mother’s embrace? spent, ready to sow the seeds. is making the book of our becoming. So it will come as no surprise when you learn I’ve written a Foreword to a new book called Poetry at Work: (Masters in Fine Living Series) by Glynn Young, himself a poet who has worked for many years in the world of business. On the one-year anniversary of 9/11, we held a vigil or memorial service in the office where I worked. We thought it best to set aside time to reflect, remember, and reconnect with each other. Gathering in the conference room, we shared our thoughts, memories, and connections, our stories, prayers, and poems. I read W.H. Auden’s poem “September 1, 1939,” and we followed it with a moment of silence. Others shared poems, told of where they were when they heard the news, someone sang a hymn, I believe; most of us cried. It was the most powerful staff meeting I’d ever attended. Later that day, I circulated Auden’s poem by email to my colleagues at work and to a larger poetry email list I maintain for National Poetry Month. The poem, Auden’s reaction to the Nazi invasion of Poland, seemed an appropriate response to the shock we all still felt about the attack on the World Trade towers, and the massive loss of life such as we hadn’t experienced on our soils since the Civil War. This poem was widely circulated in the aftermath of 9/11, as if the poem struck a collective chord both emotional and visceral. Great poetry is timeless. Back in the mid-to-late 90s, I delivered a series of talks about poetry and business life to groups of corporate leaders, Rotary clubs, and small business associations. I read poems — not my own — about how it felt to fire someone, what it was like for a woman in corporate America, and why it’s so hard to let go when you retire. I loved the reactions of the businessmen in the room, especially the older men who had experienced a lot of the feelings described. Invariably, most nodded along with something that hit home; many looked skyward and blinked back tears. Poetry moved them to tears. Poetry at work is no longer an anomaly. David Whyte, Clare Morgan, James Autry, and others helped make it acceptable. So, too, did many individual leaders and managers who were open to letting poetry into their companies, offices, and discourse. 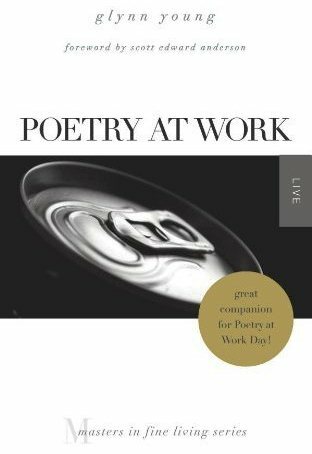 In Poetry at Work, Glynn Young argues for the poetry of work — at work, in work, and in the workplace. He finds it in the big things, such as the crisis to which he helped respond as a speechwriter for a chemical company, and in the small, everyday interactions we all experience at the office. Long ago I received a bit of advice from an older poet who told me to go out and get a real job and write about real life. It was sage counsel and I am the better for it. I have no regrets about being a working poet rather than an academic. I have spent my entire working life as a poet. Indeed, I was a poet even before I had my first job. The closest I ever came to having a traditional “poetry job” was when I worked on the editorial staff at Viking Press — that and one lecture on the process of revision given at the University of Alaska, Anchorage. I have always tried to bring my poetry to my work life and to let my work life influence my poetry. The work that lent itself best to my poetry was the 15 years I spent with The Nature Conservancy, in part because much of my poetry is focused on the natural world and our species’ relationship with it. The Conservancy offered me opportunities for first-hand field observations, unparalleled access to the scientific knowledge of some of the world’s foremost biologists, and travel to many of the Earth’s last great and most spectacular places. My time with the Conservancy provided a beautiful symbiosis between my work and my poetry. I have not since been able to reclaim that symbiosis, yet my work life still informs my poetry in other ways. I may not find direct, poetic inspiration from my day job now, but it affects the way I work on my poetry. Rather than writing late at night after being out in the field, I now find odd, furtive moments: walking to or from the office between meetings, on my subway commute, and while waiting for elevators. Occasionally, I’ll be struck by some phrase or sentence heard on a conference call and I’ll worry it until finding its marrow or proving it useless. Part of it might resurface while I’m driving between cities or on an airplane or it may be lost forever. I had a meeting a little over a year ago with a European colleague at the Grand Hyatt in New York. We were introduced by a mutual acquaintance from outside the firm for which we both work. As we met and ascended the stairs to the Lounge at New York Central, I was reminded of a poem I wrote in that bar many years ago, while working for an international publishing agency. “Drink Meeting at the Grand Hyatt Sun Garden” wasn’t a very good poem, I think, but it well illustrated my discomfort at the time, as an artist in a business setting. —is this a Woody Allen film? like those my father frequented. No Woody, no Mia, no Diane Keaton. (But wait, isn’t that Mr. Shawn by the piano? I light a cigarette after Soandso has gone. I try to bring poetry to my work life as much as possible, whether I’m giving a speech or presentation, leading trainings or writing copy for an annual report or business plan. It’s not always easy to bring poetry to work, but as my friend the management consultant Cam Danielson says, poetry adds a dimension to me that others don’t have — a way of paying attention to and perceiving the world that perhaps challenges or even changes the worldview of others. In the end, we don’t give ourselves enough time for poetry — at work or at home. If we did, our business life might be less stressful and more satisfying. We might find our work more rewarding. We might, as Young suggests in his book, find the poetry at work.